cad.py - Make Your Bot! cad.py is a CAM program that can be used to generate g-code tool paths for milling 2D and 3D objects. It operates on images instead of vector formats like Gerber, DXF, or SVG, so you'll have to export your board/object as a PNG image first. 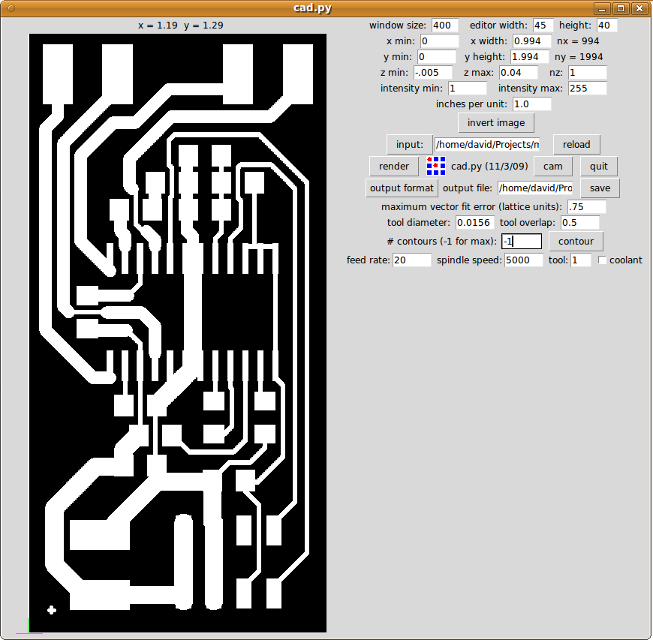 For larger objects without very fine features 200-300 dpi is fine, but for circuit boards I use 1000 dpi. cad.py was written by Neil Gershenfeld of the MIT Center for Bits and Atoms. I've modified Neil's latest version to implement the "Original start, global optimization, original Z motion" algorithm described on this page. In some cases this optimization reduces the milling path length by 50% or more.